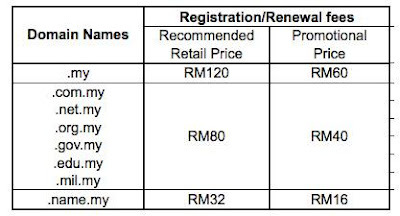 In conjunction with National ICT Month (NIM) co-organised by PIKOM and MOSTI and also in conjunction with The Merdeka Day celebration, .my domain registrations and renewal are applicable for 50% instant discount*. Promotion starts from 20 July – 4 September 2009. Update as on July 10th, 2009, 22:00 hrs: The database connectivity issue is also rectified and all websites are now fully functional. We again apologize for the inconvenience caused and appreciate your patience shown during this maintenance. Update as on July 10th, 2009, 21:00 hrs: Although the maintenance for 10th July is over, we have seen some irregularities with the database connectivity. We are aware of this and are working on a permanent fix. We expect this anomaly to be over within a couple of hours. Please note that only websites with databases might have their connections timed out. We apologies for the inconvenience caused and assure you that we will get it soon. Affected Systems : Sites hosted on these IP Addresses will cease to resolve. Inconvenience caused due to this downtime is deeply regretted. Feel free to get in touch with our Support Team, in case of any queries or doubts. UNLIMITED HOSTING is a HIT! Thank you all for the new orders, and we hope you'll like what you see. And for existing customers with webhosting package, cheers, they are automatically updated to support unlimited web space and number of email accounts! As announced via email earlier, starting July 1st, 2009, 1oasis.net now features the 1 SIMPLE PLAN at July '09 promotional price: Just RM15.99 or US$4.49 per month (billed annually plus pro-rated rate for current month). And you can start promoting your website on Yahoo immediately for that instant visits (and sales) with the free US$50 advertising credit. Get the one hosting for your domain today!